I’m pleased to let you know that Gale Cengage are giving us trial access to one of the digitised archive from State Papers Online, the Stuart and Cumberland Papers. This archive contains two remarkable collections from the Royal Archives at Windsor Castle, which have been digitised for the first time and are available online in their entirety. Trial access ends 14th December 2018. The Stuart Papers represent the correspondence and personal documents of the exiled members of the Stuart dynasty after 1688. These papers were acquired by George IV when Prince Regent, following the death of Henry Bennedict Stuart, Cardinal York, and were originally kept in the Prince’s Library at Carlton House. The collection tells the story of the lives of James II and his heirs with the majority of papers concerning the period 1713 to 1770, and provide an insight into Jacobite attempts to regain the throne. The later papers in the collection concern Cardinal York’s relations with the Vatican until his death in 1807. 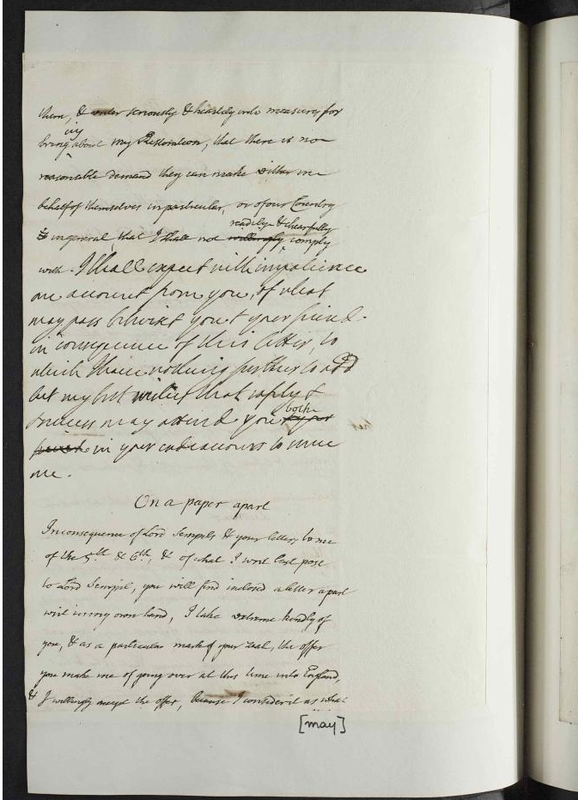 [Screenshot of] Prince Charles to his Father – with the account of Prestonpans, September 1745, RA SP MAIN/238 f.98b-99, Royal Archives, Windsor Castle. The Cumberland Papers were deposited at the Royal Archives at its foundation and are the military papers of William Augustus, Duke of Cumberland. The papers cover the period 1649 to 1765 and include the Duke’s military correspondence and order books from the campaigns of the War of the Austrian Succession, the 1745 Jacobite rising and the Seven Years’ War. They also include a number of Jacobite documents captured in Scotland after the Battle of Culloden in 1746, including letters from Charles Edward Stuart and accounts of his escape to Skye. Elsewhere in the collection you’ll find British national and foreign policy, parliamentary updates, reports from British colonies, and personal papers relating to the Duke of Cumberland’s role as Ranger of Windsor Great Park, and to his household and estate at Cumberland Lodge. 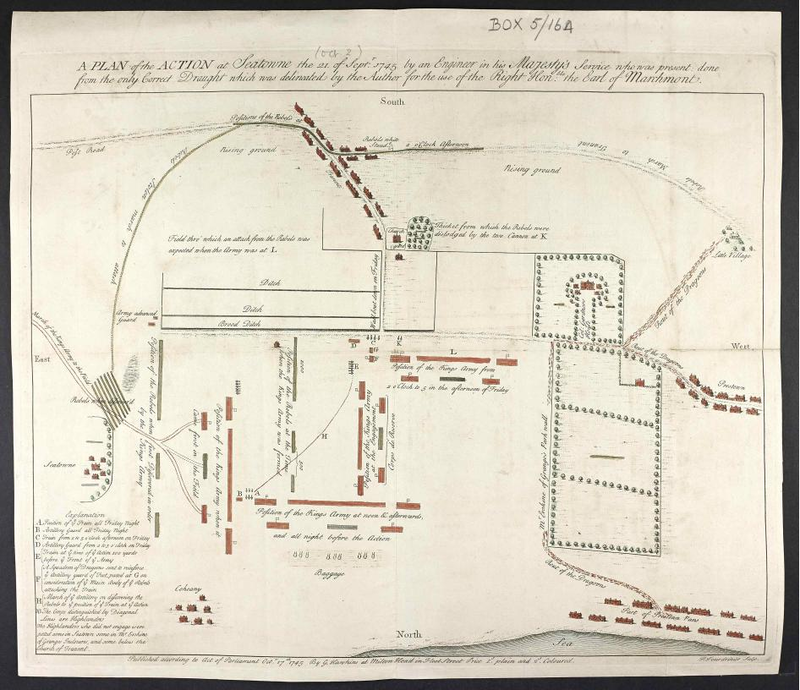 [Screenshot of] Plan of Prestonpans, September 21 1745, RA CP MAIN/5 f.164-164b, Royal Archives, Windsor Castle. Access The Stuart and Cumberland Papers via e-resources trials. Access available until 14th December 2018. Please note, The Stuart and Cumberland Papers are one of the collections available via Gale’s State Papers Online. The Library already has access to another collection, Part II, through this resource (or to give Part II its full title, The Tudors: Henry VIII to Elizabeth I, 1509 – 1603: State Papers Foreign, Ireland, Scotland, Borders and Registers of the Privy Council). And until the 21st November 2018 we have trial access to State Papers Online, Part III. When you access The Stuart and Cumberland Papers you will be cross-searching both this collection and Part II (and Part III while it is on trial). This entry was posted in Library, Online resource, Primary sources, Trial and tagged 17th century, 18th century, archives, Britain, correspondence, cultural history, Databases, Europe, History, International Relations, Manuscripts, official documents, Politics, primary source, social history by cstirling. Bookmark the permalink.